I have been enjoying Moon Rabbit Foods Products and used their pancake and waffle mix to create this amazing breakfast! These gluten-free ricotta and lemon waffles are the perfect Sunday breakfast! I just love adding ricotta to my pancakes or waffles! You can make these gluten free or use your favorite pancake mix to create these light and delicious waffles! 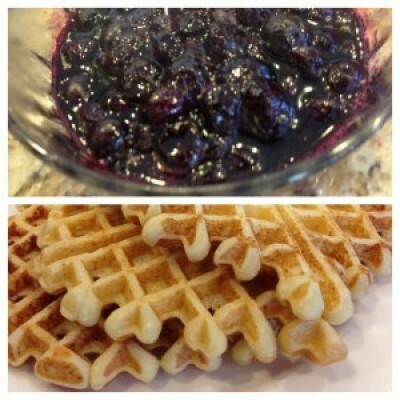 The blueberry sauce makes these delicious waffles extra special! Making the waffles: In a large bowl whisk milk, ricotta and egg until smooth; add remaining ingredients and combine well. Set aside and heat your waffle maker. In a small sauce pan heat the blueberry ingredients and bring to a boil. Immediately stir and lower temperature to a low simmer until ready! Once your waffle maker is heated; coat with cooking spray or brush with butter. Add a scoop full of batter in the center of the waffle iron and close. Let cook for about 3 minutes then check if done. (each iron is different). Pour blueberry sauce on top of each waffle!